Good morning and Happy New Year everybody. This is the beginning of a brand new year. Here's hoping it is a really good year for all of us. Let's start with the cover of my new calendar. Isn't my Pogo just precious, singing his heart out here? When I put this image together a while ago, I had the most fun! These past five and a half years with Pogo have been wonderful and I'm so grateful for having him in my life. 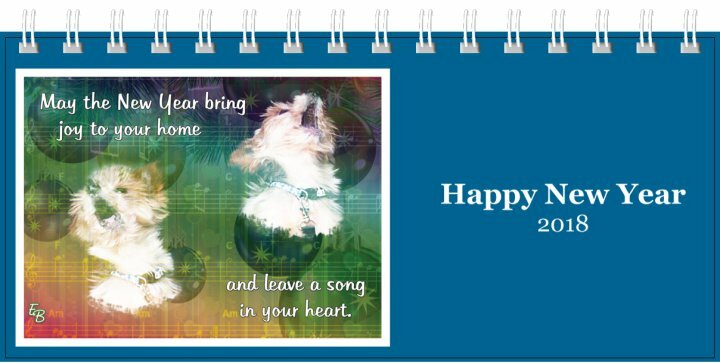 My New Year''s wish is for many more wonderful years with my little guy. Aside from being a new year, it's also a brand new month, January. So here's the first page of my new calendar. 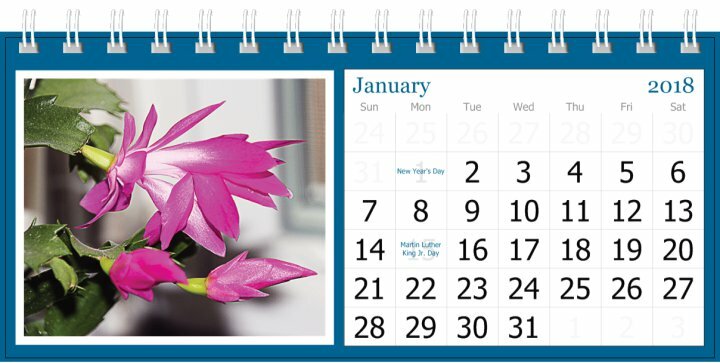 This month features my Christmas Cactus. Were any of you able to watch the fireworks display last night? Pogo and I stayed up long enough to see in the new year, but for us there were no fireworks. The bitter cold made it too dangerous. I suppose I could have watched the displays from other countries on television, but instead I watched Law & Order re-runs. Wednesday, we're supposed to be having a little heat wave of sorts. Temps are supposed to get up into the twenties. Of course, that could all change. This is New England and the weather does what it wants to do. Yesterday, SIL Eddie came over to change the batteries in my remote car starter, only to find that it is not the batteries, it's the device that tells the motor to start up. Tomorrow, I'll have to call the dealership to see if they will send a repairman out. Otherwise, I'll have to go somewhere else and buy a brand new remote starter. Just to show you how cold it's been here, I'm using a whole tank of fuel oil every two weeks. When it is normally cold, our fuel usually lasts close to three weeks. I got fuel last Tuesday, and I may have to have the tank re-filled again before next Tuesday. It all depends on how long this cold snap stays here. Today, Pogo is wearing his new fluffy sweatsuit. It's really adorable on him, and I'm hoping to get a photo of him wearing it. If I do, of course I'll share it here with you. His appetite has been a bit off lately, so last night I cooked him a steak for his dinner. Did it tempt him? Oh yeah, he licked his plate clean! What a happy sight! I don't have any special plans for today, so maybe I'll spend some time working on my laptop to make some new quick pages for this new year. This week I'll start gathering all my tax information, and I'll set up my new suitcase so that Pogo and I can start gathering things we want to pack for our vacation. Yup, that sounds like a good plan. Of course, first I have to wash the dishes. Last night I rinsed them off and left them in the sink for this morning. Well, that's my news for today. So, till tomorrow, Y'all stay warm and have a super Happy New Year. It is wicked cold where your at. I am so sorry that your fuel doesn't last so long in this horrible cold front. Perhaps it will be over soon. I hope so. Yes your calendar featuring Pogo is just wonderful. I love mine, thank you so much. I have it sitting on my desk. I have joy all year long! Happy New Year Edna and Pogo! It is good to see a New Year arrive. I just wish it would take the bitter cold weather away back into 2017. Your calendars are always so beautiful. You are so talented, Every time I try to make a calendar with photos of the kids etc. it is a fail. I look forward to a great new year and a continuing friendship here with you. Take care my friend and best of luck with the remote starter. So Where Did Our Moon Go? It's Been An Exhausting Week! A Snag In My Plans? What Else Is New! Where, Oh Where, Is That January Thaw?